The Camino de Santiago – an 800 kilometre hike across Northern Spain spanning two mountain ranges, one barren wasteland, four different provinces and, most daunting of all, five weeks sharing dorm rooms with exhausted snorers, and bathrooms with enthusiastic wine drinkers. The whole concept sounds absurd and excruciating. But they did it anyway, and nothing was more surprising than how much they enjoyed it. The camaraderie, the sense of community, the satisfaction that accompanied each day’s debilitating fatigue. Fascinating, painful, inspirational, interminable – they are already making plans to tackle it again. A casual greeting – ‘Buen Camino’ with a smile and nod. A friendly farewell – ‘Buen Camino’ while waving and turning to go. An expression of heartfelt desire to see a fellow pilgrim experience good luck – ‘Buen Camino’ said somewhat uncertainly with a slightly worried look. As a polite way of getting rid of an especially dull walking companion – ‘Well, um, Buen Camino then’ said rather sheepishly while you suddenly quicken your pace and rush off as they are relieving themselves by the side of the trail. As proof that you do, in fact, speak some Spanish – ‘Buen Camino, y, uh, thank you’. As an expression of frustration – ‘Dios mio! Buen Camino mi culo! Puta!’ while angrily staring at a newly formed blister. To cover up the fact you don’t actually remember the name of the girl who was sharing your bunk when you woke up – ‘Buenos dias…uh….amiga. Buen Camino!’ smiling broadly, slowly backing out of the room and carefully avoiding any sudden movements. Just to name a few. I have even heard of it being used as a way to transition between two very different topics when unable to come up with a suitable segue. Buen Camino! My wife, Laynni, and I tackled the Camino Frances in October of 2012, hiking roughly 800 kilometres from St. Jean Pied de Port in France to Santiago de Compostela near the Atlantic coast of Spain. There are numerous routes to Santiago, all of which are described as Caminos de Santiago. These famous pilgrimage routes have theoretically been in existence since the 1st Century when the remains of the apostle St. James were shipped to Iberia (modern day Spain) to be interred in Santiago de Compostela, presumably because this was an area he had spent a considerable amount of time spreading the word of God. Or maybe because he had always been a big fan of tapas. Opinions vary. In any case, by the 8th Century (the time of the first recorded visits) the pilgrimage to Santiago to visit them old bones had become one of the most popular in the Christian world with “peregrinos” (the Spanish word for pilgrims) from all over Europe braving the physical, mental and culinary hardships of this arduous journey on foot in hopes of reducing their time in purgatory. Of course, some were simply looking to lose weight and the purgatory business was just an added bonus. Either way, this expedition eventually became one of the most popular ways for Christians to prove their devoutness and physical superiority, and has remained such for over 1,200 years now. In many cases, virtually unchanged. Some of the bread, in particular. As for the trail itself, the route we took, and by far the most popular, was the Camino Frances, which can start at any of a number of locations in France but ultimately will pass through the tiny border town of St. Jean Pied de Port. From there it is roughly 800 kilometres of historic cities, quaint villages and wildly varying scenery to Santiago de Compostela. 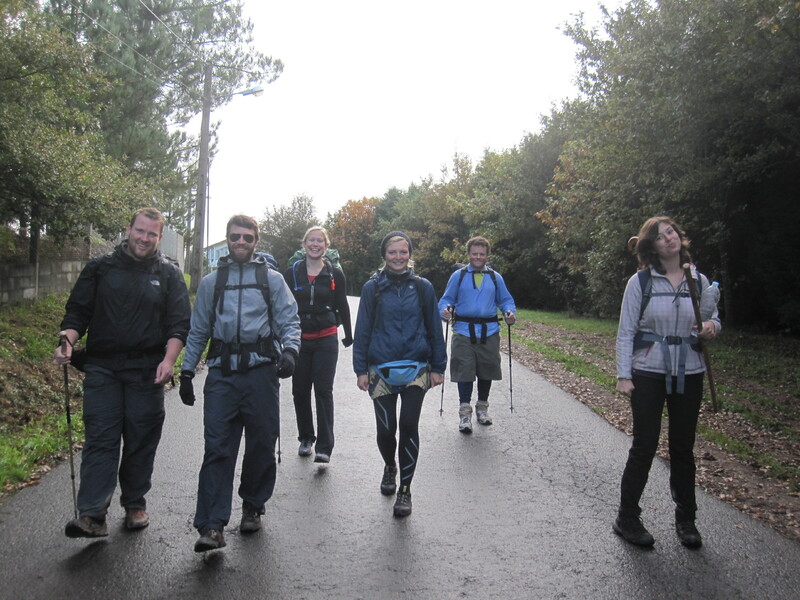 Here in the 21st Century the Camino de Santiago pilgrimage is experiencing another massive resurgence. German comedian Hape Kerkeling hiked the Camino in 2001 and then released a book about his experience in 2006 that led to a large spike in German interest. Today you will be hard pressed to find a German pilgrim who has not read Kerkeling’s book, or the equally popular Guide to Sounding Angry When You Speak German. Also, in 2010 Emelio Estevez released his movie, The Way, starring his father, Martin Sheen, even including a small role for himself. The movie’s popularity has since led to a large influx of North American pilgrims, especially people who had nothing better to do in high school than spend an inordinate amount of time watching Estevez shoot people and laugh maniacally in 1988’s Young Guns. He doesn’t do as much killing in this one but you’ll be happy to know he still looks like he’d be right at home wearing a varsity jacket and eventually confronting Judd Nelson. Wherever you choose to start your Camino, the first step is to acquire a pocket-sized passport referred to as a “credencial”, either in advance or from the Pilgrim’s Office in the town you start out from. This booklet is used to collect stamps at albergues, hotels, restaurants and bars along the way and it serves as an official record of your pilgrimage. You must have a credencial to stay in the albergues. Each location has its own unique stamp depicting something descriptive – usually the name, along with a symbol of some sort, and occasionally some added creativity such as a photo of a winking harlot or a self-congratulatory story about how the owner passed his driving test on the first try. It is also customary to purchase a palm-sized scallop shell and attach it to your backpack to denote your status as a pilgrim. A long time symbol of the Camino de Santiago and an emblem used in countless different variations along the Way, there are a number of theories regarding the exact origins behind the shell. For some it is a metaphor, with the many grooves signifying the many different pilgrimage routes that all come together to share a single destination point. Another, rather confusing, story alleges that the remains of St. James were shipped to Iberia on a magical crewless ship while a wedding was taking place on the shore, spooking the groom’s horse and causing it to dive into the ocean with him still clinging to its back, which apparently caused quite a stir as one might imagine, only for both man and horse to emerge from the ocean some time later mysteriously no worse for wear. It is suspected that the bride then called the wedding off, deciding against marrying someone who wasn’t smart enough to jump off a horse before it dove into the ocean, and the general consensus seemed to be that she dodged a real bullet there. Yet another legend claims that the ship carrying the remains, just a regular ship this time, was destroyed in a storm and the body lost at sea, only to show up later on the Galician shore completely intact but covered in scallop shells and, some claim, with a fistful of bar receipts and a tattoo of a butterfly on the small of his back. Other enduring motifs of the modern-day Camino are the omnipresent yellow arrows serving as informal directional markers. These arrows can take the form of anything from large solid signs to rough paintings decorating weathered rocks and fences to haphazard graffiti found sporadically on sidewalks, walls and lamp posts throughout bustling cities. Regardless of size, shape or precise shade of yellow, these frequent reminders form a rigid pilgrimage guide and ominous warning of all the myriad dangers that can befall a careless wayward pilgrim – from adding unnecessary kilometres to your already full hiking schedule to losing touch with fellow pilgrims to missing second breakfast to accidentally laying eyes on a mosque. By the end of the first week you’ll be seeing yellow arrows in your dreams, and not just pointing the way to the all-male sauna the way you normally imagine them. The final physical representation of the Camino, besides your irreparably damaged feet, is the “compostela”, an official certificate of accomplishment presented to weary hikers at the Pilgrim’s Office in Santiago upon completion of the route. In order to qualify your credencial must have stamps proving that you travelled no less than the final 100 kilometres for walkers, or 200 kilometres for bikers and those arriving by pogo stick. There are many benefits to earning a compostela, including priority enlistment at Catholic schools in the greater Santiago area and thirty seconds alone to do anything you want with the strangely lifelike statue of St. James inside the Cathedral, although previously the big draw was a reduction of your time in purgatory. Few Catholics actually believe this anymore, considering it more likely to simply engender God’s goodwill toward you and puts you in the good books so to speak. Which could come in pretty handy if you’re trying to get bumped up from purgatory to the pearly gates and you’re competing against one of those women who always did all the baking for her kids’ school fundraisers, or if it turns out that kidney you bought on the black market wasn’t voluntarily donated after all but was actually stolen from a Korean man who passed out at a blackjack table. One of the main religious traditions of the Camino is the Pilgrim’s Mass. These are held every day at noon in the Cathedral of Santiago de Compostela and at various times, usually in the evening, in other cathedrals along the way. In Santiago, newly arrived pilgrims have their countries of origin and the starting point of their pilgrimage announced at the Mass. It used to be a given that each Pilgrim’s Mass include the “Hymn to Santiago” in coordination with the Botafumeiro, a metal container filled with burning incense and spewing smoke as it was swung from one side of the cathedral to the other in spectacular fashion. But apparently that tradition has been discontinued. Unless, of course, you’ve got around $600 you’re willing to part with, or maybe a used ’92 Nissan Sentra in fair condition to trade. Or you can get lucky enough to have your arrival coincide with someone else having already paid for the privilege. Another sad change that has occurred recently is the ban on touching the pillar at the cathedral entrance. Century after century, hundreds of thousands of weary and relieved pilgrims have entered the cathedral and placed their hand on the pillar just inside the main door – in relief, exhaustion, faith or because people just can’t seem to stop themselves from touching things. Over time all these filthy hands touching the exact same spot eventually wore a handprint right into the stone, a real and tangible reminder of all those that have gone before, sharing a similar path of hardship, faith and emotional discovery. And now they have it roped off so you can’t touch it because, what, you’re going to very, very slowly make it more of a hand print? Or maybe they were just in the process of coming up with a way to charge money for it because, let’s face it, nothing is more traditional than finding innovative ways to separate tourists from their cash. At the masses in other towns the priest usually says a prayer for the pilgrims and, if you watch very closely, sometimes winks lasciviously at you. The Pilgrim’s Mass in Roncesvalles is a particularly good one to attend since, for most, that is their first night actually on the Camino de Santiago, and because Roncesvalles isn’t really a town but just a pair of albergues so the service is made up entirely of peregrinos. Many see it as an appropriate introduction to the pilgrimage, a great way to bond with fellow pilgrims and a convenient opportunity to scope out the female talent. Of course, for every devout Catholic looking to barter down their time in spiritual limbo there is another pilgrim for whom the Camino does not hold any particular religious significance. Many, like us, aren’t even Catholic. And although religion is obviously the most common cause of temporary insanity, there are actually dozens of reasons an otherwise sane person might suddenly decide to upend his or her life and commit to hike most of the way across Spain with only two pair of underwear. Unfortunately, all too often non-Catholic hikers find themselves insecure about their motives and how they will be accepted by the more pious and faithful. But they shouldn’t be, for the Camino welcomes one and all, then punishes them equally. Despite the enormity of the undertaking – physically, emotionally and on your soon to be virtually unrecognizable toes – people of all ages and walks of life are now embarking on their own Santiago pilgrimages. And their reasons are as varied as the pilgrims themselves. As I’ve mentioned, for some it is a religious demonstration of faith. Others relish the opportunity to reflect on the direction of their life, while some see it as a rigorous (though generally unsuccessful) weight loss regimen. Maybe it seems like an enjoyably active way to visit Northern Spain, or merely a handy way to lay low until that whole pornographic slipper scandal blows over back home. Whatever their reasons, most pilgrims hiking the Camino have an incredible capacity to acknowledge and respect each individual’s personal motivation and quickly form bonds of friendship, camaraderie and mutual pain. And even when they don’t agree upon a common purpose most still find it beneficial to remain polite to anybody they might end up sharing a toilet with. But can it still be called a “pilgrimage”? Well, that all depends on the individual. Clearly it can when done for the traditionally religious purposes. For others, though, it can still become one, often when they least expect it. It can be a new outlook on life resulting from intense physical exertion, or a long overdue opportunity for isolation and introspection, maybe a change in perspective that leads to personal epiphany, or a renewed faith in human nature, a newly discovered camaraderie of shared purpose, or simply a re-prioritizing of morals and values when it comes to how dirty you’re willing to let your socks get. In any case, in my humble opinion, the only requirement for it to be considered a pilgrimage is for it to feel like a pilgrimage to you. Which is also exactly how I feel about purebred German Shepherds. Maybe the most important advice I can pass along from an emotional and motivational standpoint is to remember that things are always changing along the Camino. People, food, weather, health, moods, perspectives, aching body parts. Most people, even though they’ve heard and read about the difficulty and blisters and snorers and all that, still show up with an 80’s montage view of what the Camino will be like. Then they are completely blindsided when they realize how difficult and uncomfortable things can become, and are entirely unprepared to deal with the extreme swings in patience, enthusiasm and confidence that pilgrims routinely experience over the course of a single day, let alone five weeks. I know of people who were on the verge of quitting and heading home one day and talking about returning to hike the Camino Norte the next. The key is to roll with the punches and do your best to never get too high, too low, or too crazily hopped up on sugar and caffeine. A famous animated spy once said “I have an El Camino”, to which his stepfather responded, “Oh, so you’re all set. That will hold way more Hispanics and lawn mowers.” Unfortunately, even though that is funny as hell, it doesn’t really apply here. But another famous person once said, “Even if you fall on your face you’re still moving forward”, and that describes the Camino de Santiago to a tee. Although you had better get up pretty soon or else this thing is going to take you forever. Of course, I also like the one that says, “Expect problems and eat them for breakfast”. Mainly because we didn’t have a lot of luck with breakfast on the Camino, and that would have kind of killed two birds with one stone. 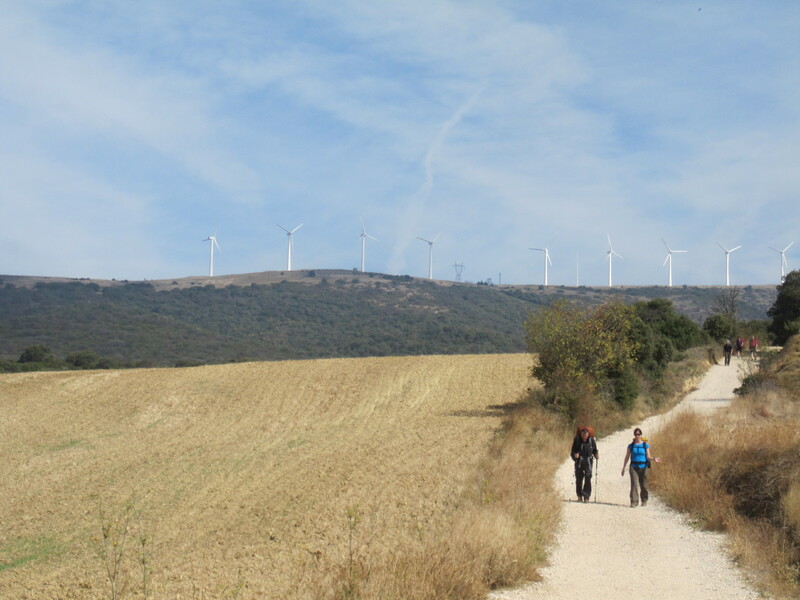 One of the most intriguing things about the Camino Frances is the impressive variety of terrain and scenery hardy pilgrims will encounter along the way. Of course, a certain amount of diversity is to be expected on a trail that starts in one country, ends in another, crosses two mountain ranges and one of the most famously harsh stretches of dry prairie in all of Europe, but the constant shifting from forest path to medieval village to rocky hillside is fascinating, not to mention very helpful in staving off the suffocating boredom for at least an hour or two each day. We hiked the most common, but by no means only, route starting in St. Jean Pied de Port just over the border in Southern France. Other more daring, or foolish, pilgrims started at a variety of locations in France, a few of them even coming from as far as Paris. Others we met started all the way back in Switzerland in early summer. Obviously, those people were wrong to do so, and really had no right to make the rest of us look bad like that. And even though we are only qualified to describe a mere 800 kilometres we still feel that our hike was pretty cool and I still fully intend to use it to abruptly change topics whenever someone gets a little too interested in my spotty employment history. So, as I have now made abundantly clear, we started out in St. Jean Pied de Port. And, as I will no doubt allude to numerous times throughout the remainder of this book, our first day tackling 1,200 metres of elevation gain up and over the Pyrenees before descending steeply into the tiny hamlet of Roncesvalles was probably the single most difficult leg of the entire hike. All the lush green farms dotting the rolling hills was like something off the box of a Fisher Price farm set, ages six to ten. The gloomy fog that rolled in at the top created a haunting atmosphere and bonds of uneasiness among exhausted and uncertain pilgrims for whom finally reaching Roncesvalles was like discovering a verdant oasis in a barren desert. An oasis of stone run by German retirees with beds covered in plastic, but an oasis nonetheless. 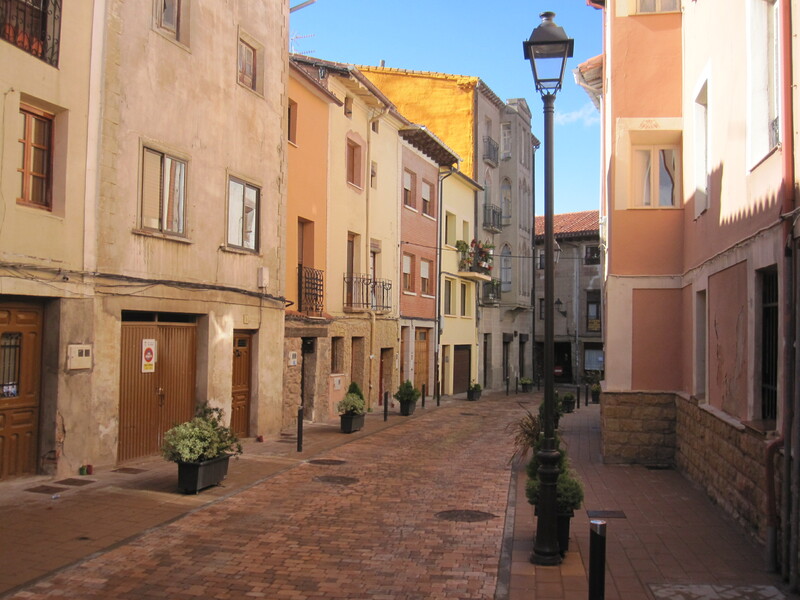 From there to Pamplona was a refreshing mix of idyllic pastures, sparse woods, recently tilled fields and one messy magnesite mine all leading to one of the most famous cities on the Camino. Pamplona’s beauty, history and penchant for pinxtos and beer all preceded it by word of mouth and guidebook description alike. Then there were more fallow fields slowly climbing through descending fog to the wildly panoramic viewpoint at Alto de Perdón. 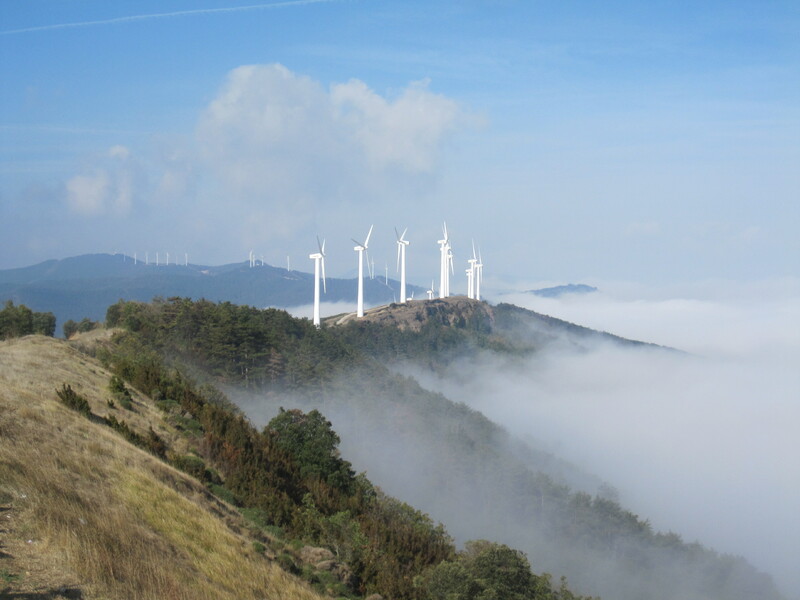 The slowly spinning wind turbines and expansive views delight the senses while the metal cut-outs of pilgrims desperately bucking the prevailing winds speak to the idiotic chuckler in all of us. Ancient Roman roads then lead us over rolling hills, across medieval stone bridges, through thigh-high stands of scrub brush and past stacks of recently harvested bales which make a great place to stop for lunch, especially if you yearn to spend the next two days picking straw out of your socks, backpack and, inexplicably, underwear. Around a week into the hike we see our first real change in the tone of the Camino. Coming out of Logroño pilgrims pass through a wild and partially manicured park before climbing through the first of many bountiful fields of grapevines and their rapidly ripening cargo. Unfortunately, this is also where you will get your first taste of, as the John Brierley guidebook describes them, the “soulless sendas”. These are purpose-built pathways that run immediately adjacent to major roads and highways, presumably to simplify the route, remove any needless meandering and guarantee that if you hadn’t started struggling with bouts of boredom yet, well, there was certainly going to be no denying it now. And don’t bother passing the time with interesting conversation about things like quick-drying socks and mysteriously disappearing leg hair, because all you’ll hear are the sounds of passing traffic, and maybe that clicking noise in your right knee. Your iPod awaits your imminent attention. This soon passes, however, as you head back to wooded hills and wide logging roads dramatically hemmed in by thick stands of pines (for the time being, at least), which slowly emerge into scenic pastures where you will suddenly face a number of route choices for the first time, but don’t let it stress you, since they all seem to culminate in huge herds of sheep and their typically furtive shepherds. 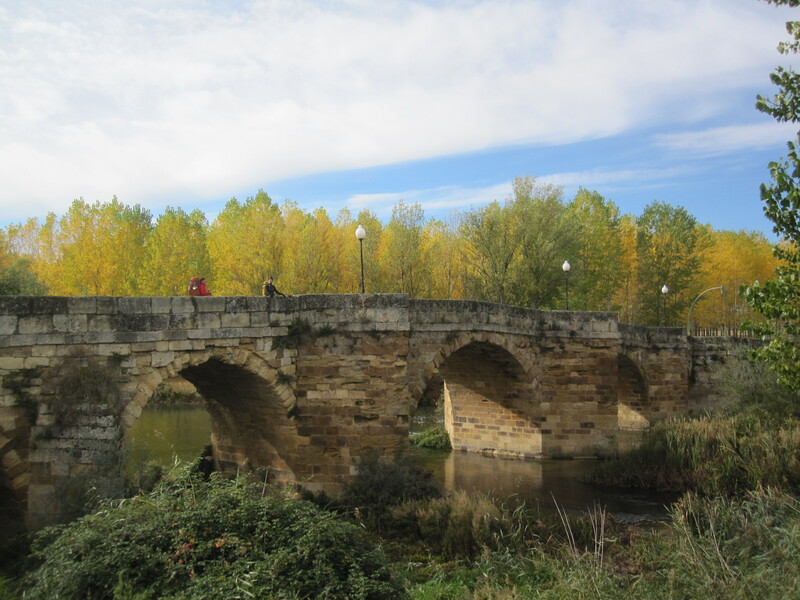 After that is Burgos which, being approximately one-third of the way to Santiago, is a popular choice as a first (or next) rest day due to its size, wide choice of accommodation and the outstanding churro stand located just a stone’s throw from its famous cathedral. It is also a great place to mentally prepare for the next stage, the dreaded Meseta. Known in pilgrimage circles by any number of derogatory terms – Land of Eternal Flatness, Spirit Killer, The Hill-Less Wonder, Heat and Dirt Incorporated, Perfect Place to See How Far You Can Shoot an Olive With a Slingshot – this roughly one week stretch of featureless farmland and towns that become visible hours before you actually arrive has a well-earned reputation both for destroying morale and for dust that makes your clothes appear as dull and lifeless as pre-Pert Plus hair. This is a place where single lonely trees providing the only shade for hours in either direction make such obvious lunch stops that queues form around them. A place where you’ll suffer kilometre after kilometre of bladder pain waiting for even a shred of cover to urinate in peace. A place where the highest point for miles around, and by far the most attractive target for lightning, is the top of your head. A harsh, unforgiving place, much like the steppes of Mongolia, or Wal-Mart after midnight. We met Madeline in the early days of the Camino and quickly became good friends. The three of us walked together on and off the rest of the way, sharing the good, the bad and the ugly right to the bittersweet end. She wrote a thoroughly amusing blog throughout the Camino and I have taken the liberty of poaching some of her stories for your enjoyment. In return, I have provided her with a coupon for one nice warm hug, to be cashed in at her leisure (not valid on public holidays or during prime time Oprah Winfrey specials). 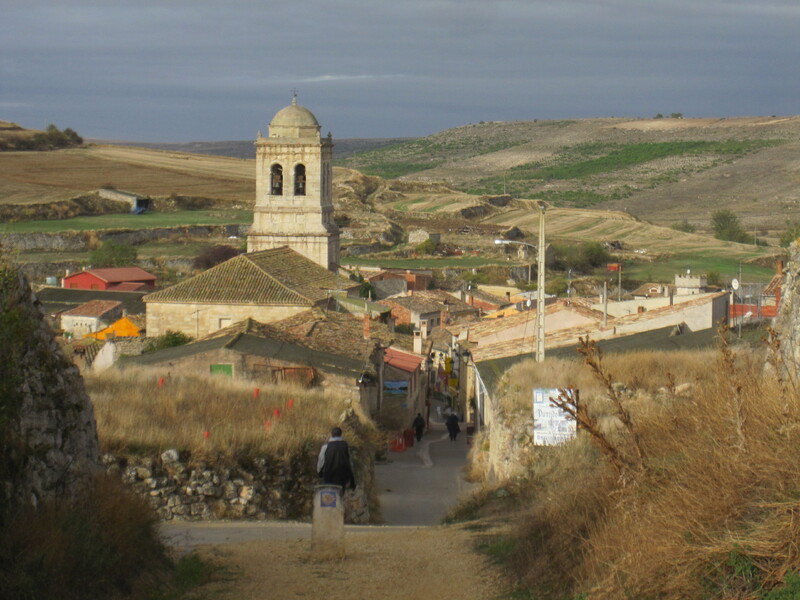 The middle part of the Camino is called the Meseta. It’s long and flat, and in the summer unbelievably hot. Everyone talks about it being the most challenging part of the hike because even though it is flat it can be quite boring and so it is considered psychologically demanding. While I was in the Meseta, though, I didn’t think it was so bad. I thought it was kind of a lot of hype. I thought more than once that these hardships must not apply to us fall folk because it is so much cooler this time of year. 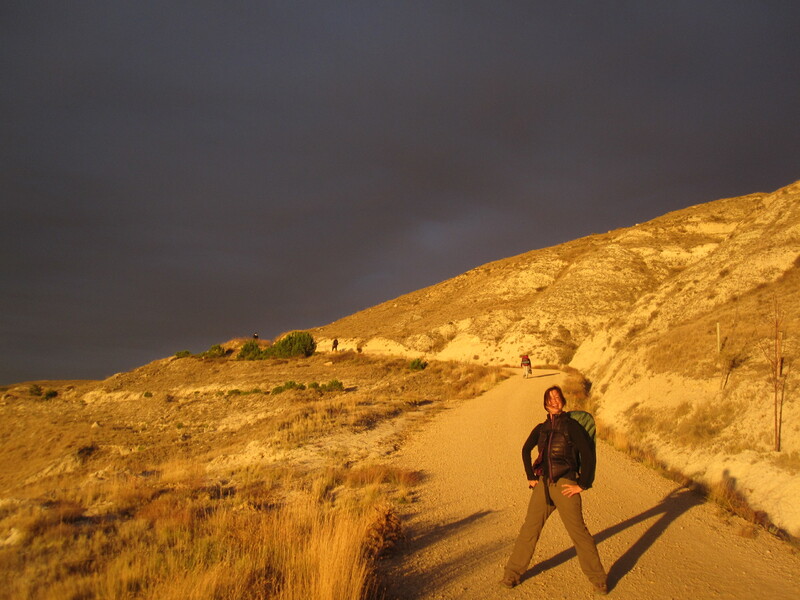 Having come out on the other side of the Meseta and begun the hike to Galicia, I am realizing I was dead wrong. The hiking these days is a completely different animal then the Meseta. If the Meseta was an animal it would be the fat, banal cat your neighbor had. Completely calm. Nothing special to look at. Couldn’t get a reaction out of it if you tried. You spend time wondering how it got fat when it doesn’t seem to move at all. Even to get food. But you soon grow bored of thinking anything about the cat and eventually stop thinking of it completely even though it is still in your presence. Just lying there. Always lying there. Then after Leon you meet the most amazing German Shepherd. Tireless. Energetic. Happy. Playful. Something you actually enjoy spending time with. It makes a big difference in how the time passes. It’s like I have a permanent companion that makes everything more enjoyable. As the full effect of the Meseta begins to wane both into and then out of Leon, another popular rest stop and an excellent city in which to shop for super-glue, the terrain finally starts becoming more and more varied, even if that variety mostly involves stubby little bushes and fields covered in manure instead of just plain old fields. Then ever so gradually the hills start to grow, the ferns appear with more frequency, as do the rocks, until finally you reach Cruz de Ferro, at 1,500 metres the high point of the trek. This enormous pile of rocks with a giant iron cross sticking out the top is traditionally where shattered and dispirited pilgrims leave, in addition to random unwanted items, some particularly meaningful rock that they have been carrying, I suppose, since the start and, wha-paw!, new lease on life. Or so I understand it. I kind of forgot about bringing a rock, or just couldn’t be bothered to add even a few extra ounces to my backpack, I can’t remember which any more, and it seemed a little stupid to just move one from the path to the pile at the last minute like that. So I remained shattered and dispirited, and slowly trudged on. From there it was a long and uncomfortable traipse downhill on loose shale and scattered rocks into the valley around Molinaseca and a transition into some serious wine country. Acre upon acre of grapevines as far as the eye can see, all sagging under the weight of their fruity burdens and dazzling in the multi-coloured splendour of autumn. Not sure what it would look like in the summer, although I’m pretty sure you’d be sweating more as you looked at it. Then hills, and more hills, and chestnut plantations, and soaring freeways looming far above tranquil rural scenes straight off the cover of Tiny Spanish Villages magazine. All gradually leading you upward toward the bleak windy ridge featuring O Cebreiro and its vaunted views of valleys on three sides, and a rather grim cemetery on the other. After that it’s all downhill, both literally in terms of elevation, and figuratively in terms of trading picturesque views from high mountain passes for ineffectual stone fences, disdainful sheep, occasional forests and eventually satellite towns. Not that the scenery is no longer lovely or verdant or serene or any other overly effeminate adjective you can think of, it’s just not as good as before. And by now you’re so close to Santiago you can practically smell it, although don’t be fooled, that is almost certainly just a passing Spaniard, but the point is you will now be finding it harder to concentrate, and living in the moment will finish a distant second to wistful daydreaming about fast food restaurants, ritually burning underwear and long noisy shits in private hotel bathrooms. 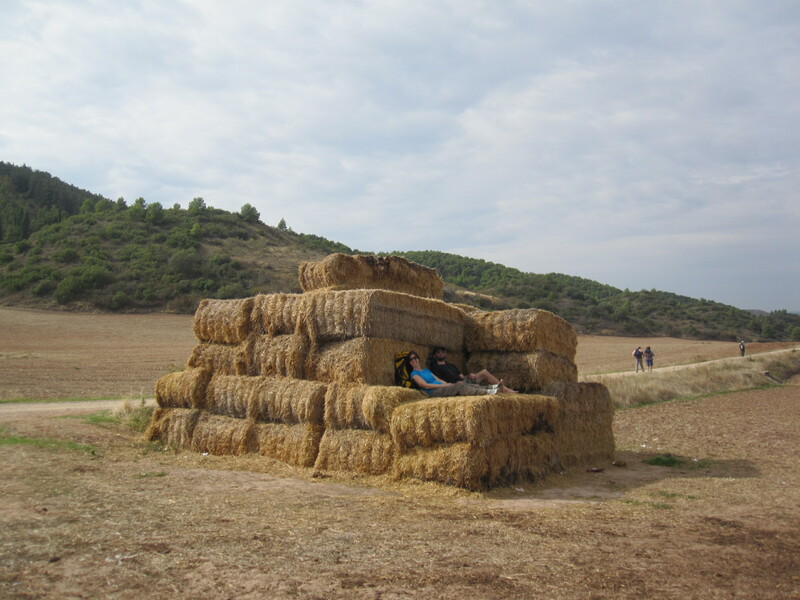 In summary, the scenery and terrain of the Camino Frances is impressively varied, extraordinary in spots, highly mundane in others, and generally always agriculturally themed. It does not compare to more spectacular mountain treks such as those in Nepal, Chile or the Rocky Mountains. It lacks the sheer drops and ferocious dolphins of Hawaii, the Wonder of the World payoff of the Inca Trail and there is nary an African to be found, but what the Camino may lack in extraordinary views or Mediterranean sunsets it makes up for in cultural diversity, historical participation and a truly unsurpassed feeling of community. In my experience, this is the only place in the world you can achieve such easy friendships and relaxed camaraderie without committing to a three-year contract with the Vodafone family of mobile networks or joining the Bearded Collie Friends group on Linked In.